Now with HAG fc&bc, and paper scans of the first & last pages, and pages #3 & 54. Notes: Some sources (Golden Age Comics at http://goldenagecomics.co.uk/index.php?cid=3|) list the publication date as March 1941. Roy Thomas reports Fall 1941, in Error Report #2568. Overstreet Comic Book Price Guide (35th Ed) lists May? 1941. Gerber lists the publication date as 10-15-41. Copyright Registration publication date is Oct 15, 1941. Synopsis: A mysterious character, calling himself The Ghost of the Deep, kills to get a formula that will enable him to solve America's invasion problem: by sinking government ships with a mysterious force. 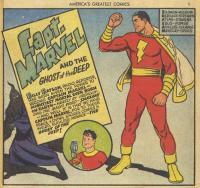 Captain Marvel heads to the west coast to see if he can discover the cause and put a stop to it. Credits: Pencils: Don Rico? | Inks: Don Rico?